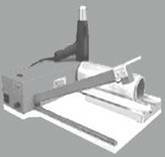 From industrial grade to economy, AJM has a selection of heat guns and sealers. New to shrink wrapping? Check out our Shrink Bag Starter Kits. AJM's starter kits contain all the basics you will need to begin. If you need a specific item not listed below or a custom order, feel free to call us at 1-800-845-6839 for pricing. 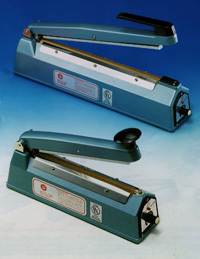 2B-PBS100 4" $89 4.5 Shrink bag sealer for small bags up to 4" wide. 2B-PBS300 12" $115 12 Shrink bag sealer used on 9 x14 shrink bags and bags up to 12" wide. Larger bags can be done by step & repeat method. 2B-PBS400 16" $149 17 Shrink bag sealer for 14" and larger bags. 2E-MLB-12 12" $385 25 All metal construction, smooth double rollers, built for safety and quality assurance. Extra heavy-duty transformers and fuse protected system. Double hinged sealing arm. Works well with all shrink films. Optional timer available when ordering. No warm-up time--Impulse sealers are always ready when you are! These sealers are made in the USA and built to last. Comes with a 2-yr warranty. 2E-XTAL-13 13" $229 20 Basic economy system for low volume use. Light weight transformer for light duty, fuse protected. Wood base construction. Film support. Made in the USA. Comes with 200+ feet of PVC shrink film and 1-yr limited warranty. 2H-EP-6UL $79 5 This premium heat gun is fast and efficient. Works fast on PVC bags and films and best heat gun for Cryovac (Polyolifin) shrink films. 600 -900 degrees with variable temperature and cool down cycle switch. Heat gun has strain relief on cord. 1-yr warranty. 2H-1200 $49 2 This lightweight heat gun is good for small jobs and light volume use. Must be cooled down by standing on end with nozzle pointed up. For a heat gun with cool down mode, see item #2H-EP-6UL, the Premium Industrial Heat Gun.